On an extremely basic level, all sailboats function more or less the same. They can sail towards the direction that the wind is coming from (upwind), away from this direction (downwind), or across the wind (reaching). Hobie Bravo, left. Club Flying Junior (FJ), right. The Bravo was designed to be sailed by one person, or "singlehanded", though it can be sailed with more than one person aboard. The FJ was designed to be sailed by two people, or "doublehanded", though more skilled sailors can sail it solo. 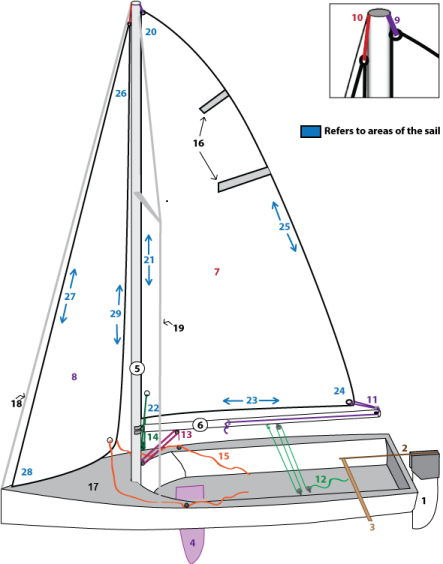 Sailing dinghy - sailboat that primarily uses the weight of its crew to stay upright. Windward - the side of an object that the wind is blowing onto. 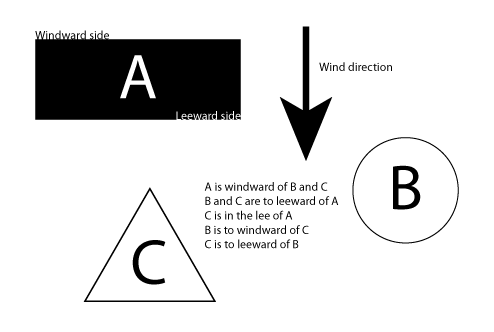 This can describe the position of objects in relation to the wind direction and each other, where the windward object is the one closer to the wind. Leeward - the side of an object opposite to the side that the wind is blowing onto. This can describe the position of objects in relation to the wind direction and each other, where the leeward object is the one farther from the wind. Now have a look at this labeled diagram of an FJ. You don't need to memorize all these terms immediately, but keep referring back to this page (terms link back to here) when you can't remember what part is which! 3) Hiking Stick (aka Tiller Extension) - A stick that attaches to the tiller. It is what you hold on to and move side to side to turn the boat. 10) Jib Halyard - The line that hoists (pulls up) holds the jib sail. 12) Main Sheet - A line that goes from the boom to the middle of the boat. It is used by the sailor to control the main sail. 13) Boom Vang - A line that attaches between the mast and the boom. It holds the down boom at the right height. 15) Jib Sheets - Lines that attach to the jib in order for the sailor to control them. 18) Forestay - A metal wire that attaches to the front of the boat. It helps keep the mast upright.